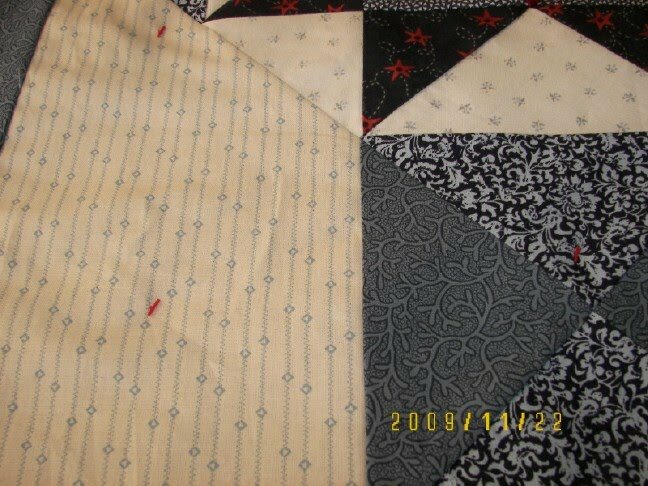 Today I'm preparing to baste my QOV (Quilt of Valor) quilt. It's cool outside so we tried a set-up in the family room, which works, if I'm not planning any other activity for the next few hours. See this clamp? from DH woodworking tools? It works well, depending on the underneath table configuration. See the little C clamp in the next photo? T'ain't work a tinker's darn! Too small, too tedious, the flat area is too small. The orange clips work well, but one needes muscles, and they only work in corners of my table - again, this all depends on how your table is built underneath. This is the product I've been wanting to try - a Dritz Basting Gun. As I am allowing myself the pleasure of an occasional manicure in my Senior years, I find the safety pin method is very hard on store-enhanced nails -- maybe this gadget is gentler and will do the job. First, it comes with 500 little red tabs, and one needle. I used almost all of them on a 60 x 80 inch quilt, so I would recommend having a few extra packs of the tabs. Cost of the gun at JoAnns with 40% coupon was about $23.00. It is suggested one purchases the grid that goes under the quilt, on the table, so you have something to press the gun against. Or you could reach under the quilt and press the fabric against the gun (ugh). 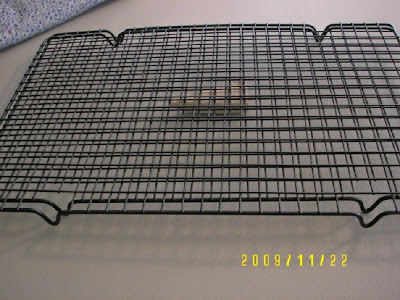 JoAnns did NOT have the grid, and I couldn't find who had one. I THINK it may resemble honeycomb grid, about 1 inch tall, and maybe 12 inches square, that will slide around the table under the quilt -- think lighting accessories?. 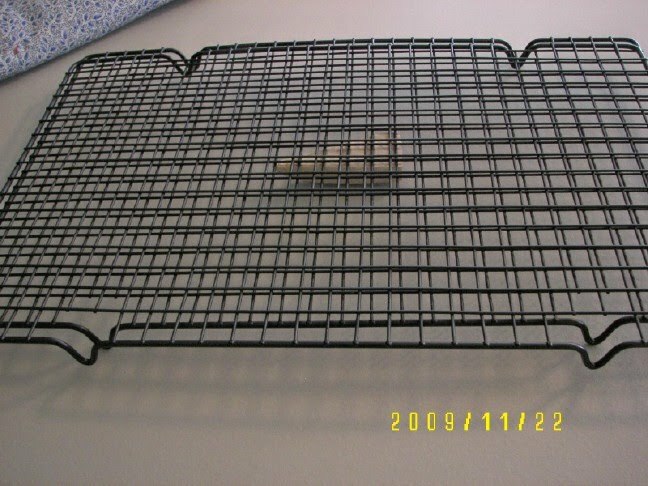 We discovered that 2 gridded cookie cooling racks, when stacked, were about 1 inch tall, that worked reasonably well. We glued a little block of wood to the center of the cooling rack to keep the center from smooshing down when I pressed the gun against the quilt. Some people are afraid the little tags will make holes in the quilt. (below) However, the tags are very slender, and much less 'catchy' than safety pins. I've run over then with the sewing machine with no notice at all. But the needle IN the basting gun is larger and therefore leaves a hole which I am sure will disappear with a bit of mist. I would NOT use it on tightly woven fabric, like batik. I presume you would carefully snip them off as you quilted along, merely brushing the little pieces to the floor. We each had a good 2 hours of frustration, getting the 'hang' of this gun, so my expected time of 2 hours for basting, took about 4. When it worked it worked great, and I could just shoot, shoot, shoot, scooting the rack along under the quilt. Not sure what happened, but we both met our level of frustration. (And we did NOT study the instructions - kinda glossed over them.) DH had better luck with it than I, which I eventually learned was muscle! It was hard to tell when it was time to pull the trigger HARD. Kinda sloppy feeling. We are hoping this was another one of those learning experiences, and I AM planning to use it again on the next quilt, when I get more tabs. I had the BEST luck around the quilt edges when I just held the fabric in my hand and pressed the gun against the fabric. Click, click, click, about 20 times in a row, all perfect! A bunch of the plastic tabs ended up on the floor, and this might be dangerous if one had pets. Would cats eat them? They vacuumed up well. What I/we did NOT like was the fiddling when the gun jammed, taking the needle out, and setting it back in, dropping it, the little button that held the needle IN would fall OUT of the gun. Was this our learning time? Maybe it was our fault? I came from a family where good tools were important. I felt this gun was a little clunky - it would be really great if it was made better, you know, with more heft, better "feel." I might make that suggestion to Dritz. I wonder what the stores use for marking garments, etc.? So, all this explanation is what kinda works/doesn't work for me for my basting system! 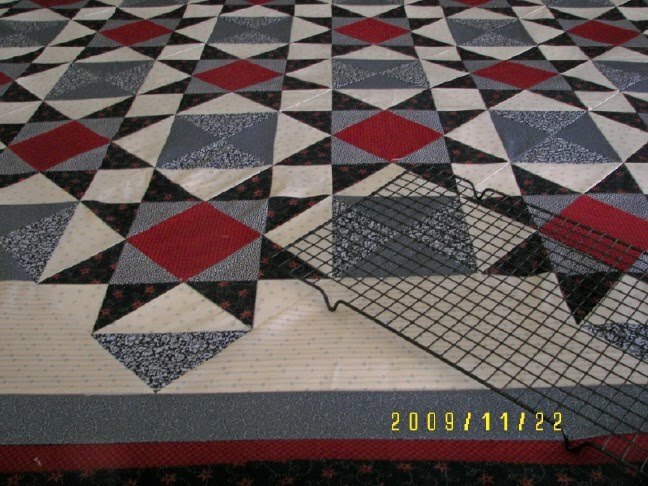 I wonder if each of you who baste their quilts at home, go through a similar trial and error system! 8-)) I have not tried Sharon Schamber method with the 2 x 4 -- another time maybe. This project wore me out. Hope you all have lovely family Thanksgiving. I am so thankful for all of YOU and thankful to Blogger for giving us this wonderful opportunity to share our pleasures. I used to own this gun and sold it in a quilt flea-for-all for $1. This product was nothing but frustration for me and I spent more money than necessary purchasing the tabs. Sometimes it worked and most times it did not. I had more wasted tabs than those holding the quilt together. I get rid of things that don't work because every time I look at it it reminds me of that bad experience. I sure hope other readers have had success and can give you some tips. Sounds frustrating to me. I have pinned two quilts because they had Minkee backs and spray basted the others. I love spray basting. They make a niffy tool to help with closing those safety pins, but I have never tried it. Sometimes just basting with thread and pulling out as you go..is less frustrating. Thanks for sharing your experience with this. I have that gun, but have not tried it yet. I'm not sure that I would be happy with it, at least not for a big quilt. I'll have to try a small one, I guess. It's good that you can run the sewing machine over the tabs with no damage...that sounds like a plus! Thanks for the product review. That gun thing sounds like too much fiddling to be a time saver to me. And the one time use tabs could get costly over time. I'm still sold on the spray baste using 505 spray (my favorite) although a bit expensive. Good old thread basting is my fall back method but I can't say I like it 'cause it takes so long and kills my back. I've pretty much abandoned the safety pins. Had one of those too and got rid of it. I found that if I clipped them out near the machine throat plate they would drop into the feed dogs - not good. I really like the Sharon Schamber method. 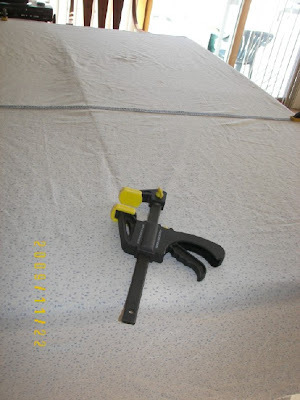 You can sit and baste and it works well - have not done a large bed quilt that way yet though. The large wall hangings were not hard to do and will try it on the large quilt I am working on when ever I get it all pieced. I have not really had any interest in using the basting gun, but appreciate the product review. My preferred method(s) thread basting ala Sharon Schamber or pins. I only use the spray in calmer weather and on smaller projects. I'd used this in the past too -- before the longarm and can't say I loved it but it was OK. I have never considered buying this gizmo. I use a long pair of tweezers to close the safety pins as I have "enhanced" nails too. Yes...my cats would gobble those little pieces right up! And I agree with the commentator who said they fall into the machine if you clip too soon. 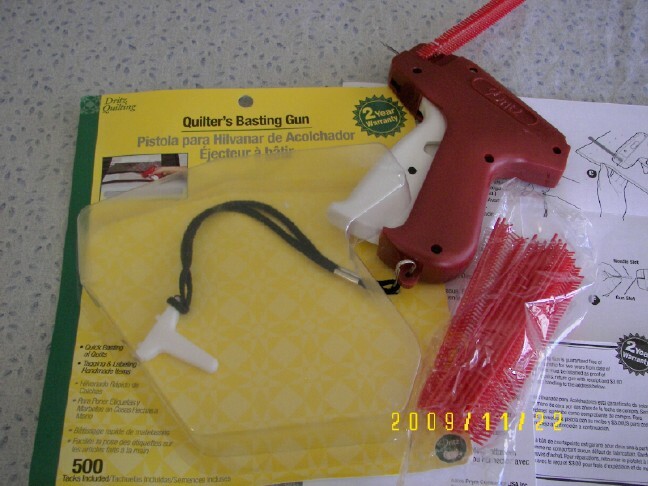 I did buy a professional tagging gun to add tags to my purses and petbeds. Works great. And if I did try it for basting a quilt...it does not need and strength to use. I've used the Schaumber method for basting with the 2x2/4s. It was great for a small quilt 18 by 24. I don't think I would like it for a large quilt. It was time consuming in my estimation but it did do the job. Thanks for sharing re the gun -- never been tempted to buy one, thank goodness. Thanks for the review... does seem a bit fiddly. Love the quilt though. Had one. Hated it. Threw it out. I've only glanced at those tag guns but they never appealed to me as a great method for basting. A safety pin takes a much bigger bite and holds tighter, I think. Thank you for the run-through of your experiences, it always helps to have first hand accounts! I have had very negative experiences with the basting gun. The one quilt I still have that I basted with the gun to this day has plastic bits inside that scratch your skin when you run your hand over it! And I hated the little plastic bits everywhere including inside my machine! But some quilters just love it. I fell for this gadget and wished I had saved my money. It resides in the bottom of my sewing basket and I will probabaly never use it again. I only used it on one small quilt. The thing I hated the most was the little red basting tabs seemed to be long enough to let the top shift unless you just peppered the surface with them. I'll stay with safety pins because I don't have nails to worry about! I use the spring clamps too. In fact, I need to go to Northern Tool and see if they have any more of the small ones. They have rubber pads and I don't feel guilty using them on the peninsula countertop in the kitchen where I baste small quilts (have to be smaller than 30" wide, though). 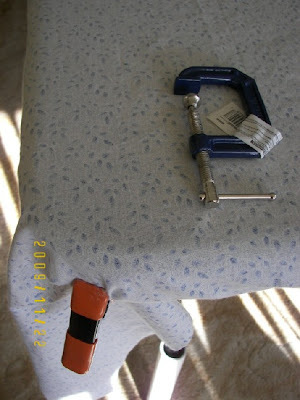 They also work well on my folding metal tables. Just stopping in to wish you a happy Thanksgiving! Thanks for the product review Elaine as that's the sort of thing I might fall for while looking for an easier way than the safety pins. I use big bulldog clips on my old kitchen table that work well as it is about an inch thick. The quilt looks marvellous - I went "oooh" went I first saw it - it makes an impact. For the grid don't buy the fritz version ... Just go to a large hardware strore lowes or home depot and purchase an overhead florescent lighting grid - they are about 2 feet by 3 feet and you can tie ribbons through the edges that span the length and width of the quilt to pull it along as you go you don't have Toledo lifting the quilt to reposition the grid !